Many envision having a grand wedding ceremony and reception where all their friends and loved ones are there to witness a union. But Alva and Bo's intimate nuptials might convince you to downsize your guest list to two. The couple decided to have their own destination wedding in San Francisco to tie the knot at the gorgeous City Hall. 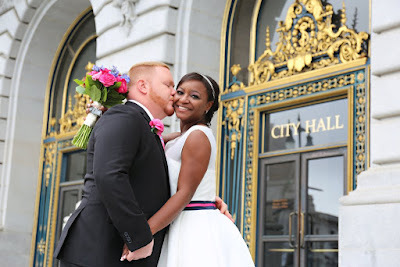 The five-day trip included just them and their wedding photographer, exploring the city and Alcatraz. "Alva had her dress custom designed with her favorite accent color, pink, and added fabulous pink patent-leather heels for her big day styling," said their photographer. "These two are so clearly in love and they do know how to have a good time, and it shows in all the photos." See the pictures ahead!